Let’s be clear right from the start. Project Diva f on the Vita is an enjoyable music game. It has great music, stunning visuals, and a staggering amount of unlockable items to customize how you play. But as good as it is, the PlayStation 3 version, Project Diva F (now with a capital “F”), is even better. Simply put, Diva F just looks better than the original. And while this may seem a no-brainer (as one is on a home console and the other on a portable one), it’s particularly impressive in this case. Diva f looks absolutely stunning on the Vita. When playing it for the first time, I thought I must be watching pre-rendered videos in the back grounds—until I found I was able to completely change the character models of the singers and discovered it must be running in real time. In Diva F the models and backgrounds are even more detailed, making it look even more excellent. Another great thing about the switch to the PlayStation 3 is the increase in processing power, which leads directly to a decrease in loading times—which was pretty much my only major issue with the Vita version of the game. While loading time is not totally absent, there is an obvious decrease when loading songs—and when it comes to navigating the item store and customization options, the difference is like night and day. Project Diva F features six extra songs not included in the Vita release. This brings the total number of songs from 37 on the Vita to 43 on the PS3. Moreover, each song comes with a myriad of new outfits and accessories to be unlocked, adding even more incentives to keep you playing the game. While these songs are now also available to Vita owners, they cost an additional 3,000 yen (about $30 US). So this is one heck of a nice bonus for PS3 owners. Personally, I did not enjoy the touch controls on Project Diva f. On one hand, I had issues figuring out the timing as to when, exactly, to swipe. On the other, as a gamer with sweaty hands, I had to accept the fact that after ten to twenty minutes of play, the touch screen would stop responding—causing me no end of frustration. Time to level with all of you. I have an embarrassing secret. My hands sweat… a lot. And as the PS3 lacks touch screen capability, all the star notes that used to be performed by swiping the screen are now done by flicking the right thumbstick. Sweaty hands aside, I found the stick much easier to use and the technical zone gameplay (where the stars are the most prevalent) greatly improved as a result. The downside of the loss of Vita features is the disappearance of the game’s AR features. 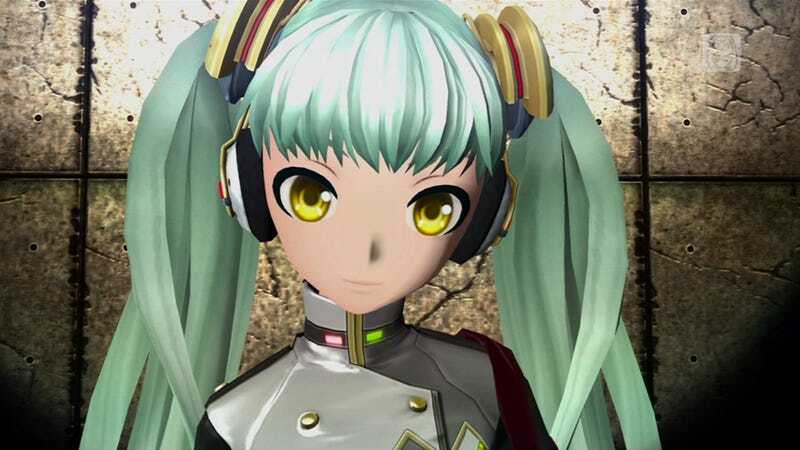 However, while the AR was fun—and made the game stand out among its Project Diva brothers— it has been replaced with the “Live Studio” mode. In this mode you can still see the songs unique to the AR portion of the game but now in a premade stage background while you control the camera angles. In the time I spent with Project Diva F, I found I kept losing button prompts among the flashy, chaotic backgrounds. Sometimes, this was just because the color of the button matched the color of the background animation; other times, I suspect it was because I was paying too much attention to the videos going on in the background. Though, in truth, I never remember having any issues tracking the button prompts as they flew onto the screen when playing the Vita version. So perhaps screen size—i.e. playing on a screen where I could easily see every part of the small screen versus looking at a 42” TV that bleeds out into my peripheral vision—had something to do with it as well. Project Diva F is a great update to an already enjoyable music game. It looks better, it plays better, and—on my surround sound system especially—it sounds better also. If you skipped Diva f because it was only on the Vita, now is the perfect time to rectify that fact. And while the game is only in Japanese, it is incredibly import friendly. Even if you don’t know a single word of Japanese, you will have no problems playing it.